Field season is a magical time of the year when we set up experiments, record videos, collect blood samples, measure animals, and generally spend each precious moment gathering data. As animal breeding and activity seasons come to a close, we wrap up the experiments and are faced with the next phase: figuring out what happened. All of those preserved specimens must be identified, dissected, and organized. Other samples need to be analyzed for content, which can involve long periods of time at a stereoscope separating out ant heads from lizard poop for diet analysis, or counting zooplankton in water samples. Time spent at the bench can feel a bit tedious after the controlled chaos of field season but this is when we really begin to get information from the experiments. Sometimes there are great discoveries, too! 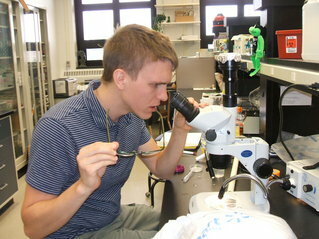 What seems mundane can be quite shocking under magnification (just look at Brad‘s reaction to zooplankton). If you’re ever in front of astereo/dissecting microscope, take a chance to look at your finger under high magnification – you might find some surprises. Since we are predominantly an ecology lab, our actual lab space is often a collection of everyday objects, like child swimming pools, plastic storage bins, nail polish, rulers, flagging tape, and the like. This past week it has been transformed into something closer to what you might imagine for a laboratory – namely, a place of eppendorf tubes, nitrile gloves, pipettes, and people with serious looks on their faces. Several studies in our lab are investigating the effects of some potentially stressful factor (a stressor), such as a fire ant attack, on hormone levels and behavior, or the effects of the stress hormone corticosterone (CORT) on behavior. This research involves collection of blood samples as quickly as possible, which are then spun in a centrifuge to separate the red blood cells from the plasma (the plasma portion contains the CORT). The plasma samples are kept in the freezer until there are enough samples to analyze through a common laboratory technique called enzyme immunoassay (similar to ELISA, if you’d like more details). In a series of steps, wells on a microtiter plate are prepared so that the hormone contained in the plasma sample will attach to the walls of the plate. 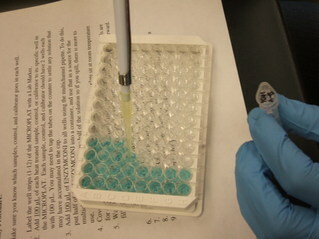 After some incubation and wash steps, an enzyme substrate is added, which changes the color of the liquid in the wells. The plate is then inserted into a microplate reader that passes light through the liquid and measures the absorbance of the light. There are controls on the plate with known concentrations of the hormone; we use the absorbance from these wells to make a standard curve. We’re then able to use the slope of this curve to determine the concentration of CORT in our samples. Voila, numbers from blood samples! 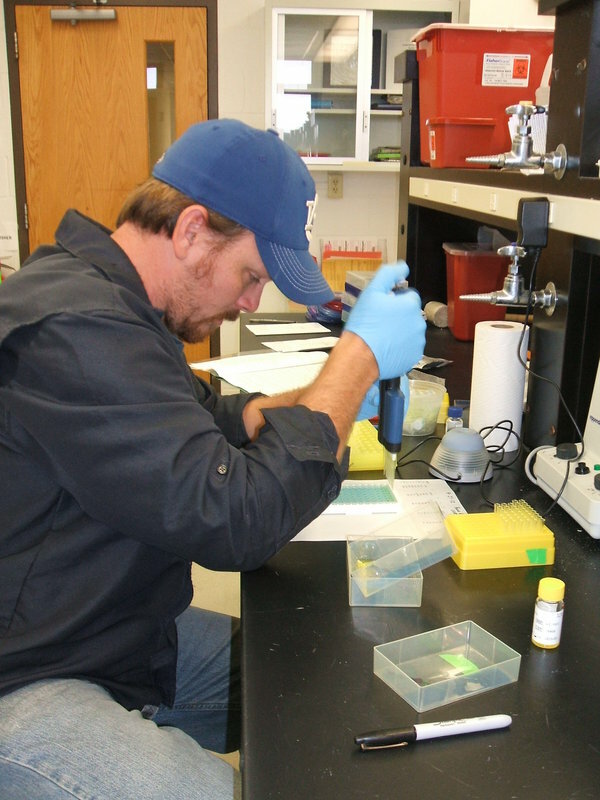 Sean using the multichannel pipette for the CORT assay. 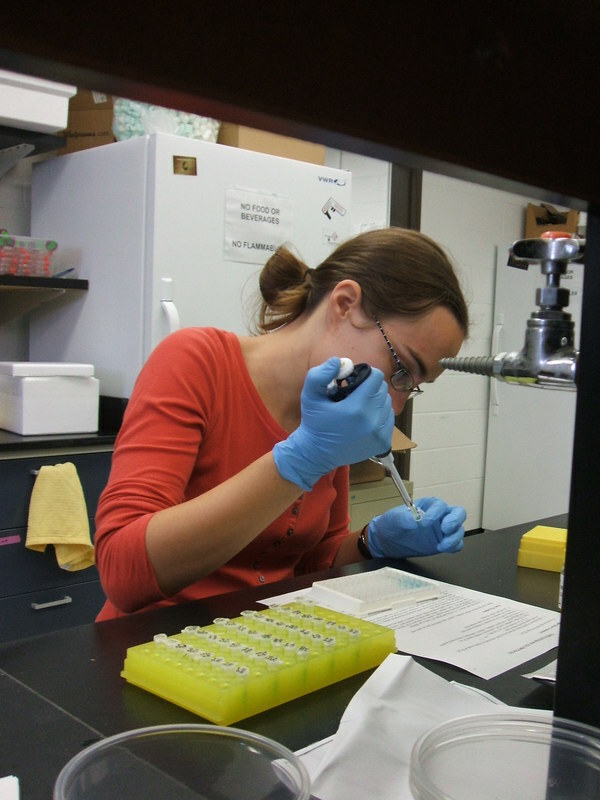 Last week Sean, Gail, and Jenny were running CORT assays for lizards and amphibians. I was able to catch them in the act – the act of science! As you can see, real scientists don’t always wear lab coats. The photos shown here are not staged, but are actual snapshots of scientists in their natural laboratory environment. The last photo shows the final step of the analysis: the number crunching in a spreadsheet to make the standard curve and calculate the CORT concentrations. Jenny prepping her wood frog plasma samples for CORT assay. 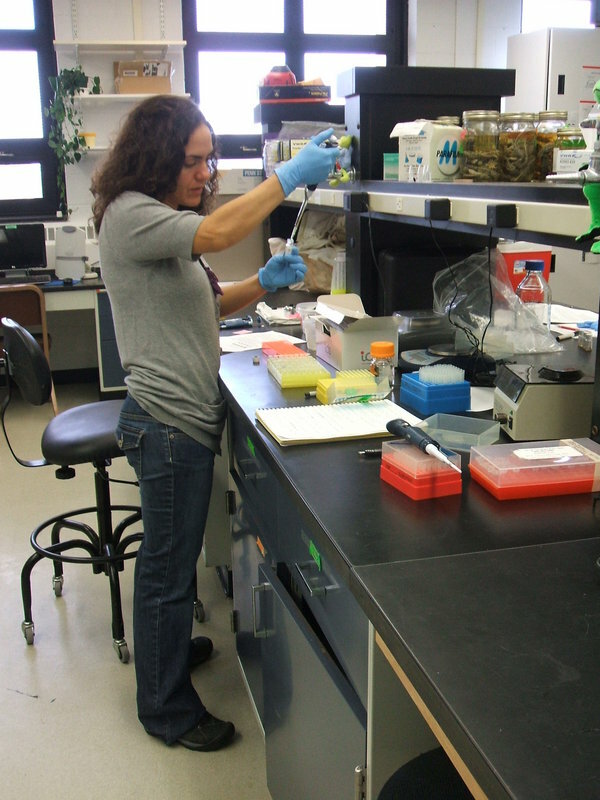 Gail adding her samples to the microtiter plate. Jenny, Gail, and Sean crunching the numbers after running CORT assays last week. 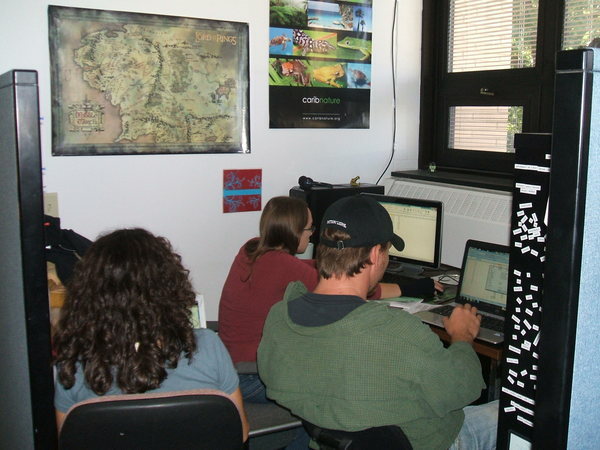 Categories: Research in PA | Tags: by Renee, cort, fence lizards, in the lab, stress, wood frogs | Permalink.